Speaking of the wine cooler, I have one with dual climate control for top and bottom. 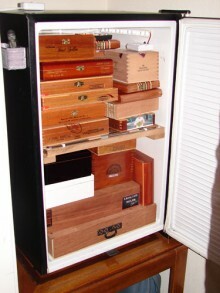 Do you find that it is ok to remove a cigar from the cooler and then light up or is it necessary to let the stick get to room temp first. I'd be concerned with sweating, then again, I guess the fire of the tobacco could speed that up. thanks. I'll be stashing my sticks in the cooler before long then. The temp is beginning to tick up here. I don’t believe it’s necessary to let the cigar acclimate to your room temperature. I know I’m in somewhat of a minority, but I tend not to view cigars as being nearly as fragile as some others do. I do know that many of the manufacturers I’ve met don’t seem to treat cigars with anthing resembling a delicate touch.